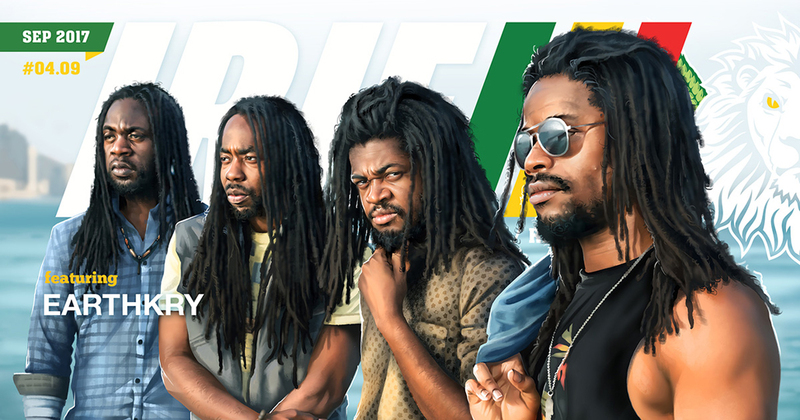 WORLDWIDE – Sep 28, 2017 – 4:20 pm – IRIE™, the international reggae magazine for everything roots rock reggae music, today released its September 2017 World Reggae edition (#04.09) of IRIE™ featuring our family, EarthKry, on the cover. The September issue includes an exclusive interview with EarthKry as they celebrate the release of their album, Survival. The issue also features a special Brazilian reggae artist showcase presented by Fabiana Rasta featuring artists Gabby Santana (Brazil), Rafa Winner (Brazil), Reggaebelde (Brazil), Regaplanta (Brazil), Henrique Veras (Brazil) and Mr Chinaman (Brazil). The ROOTS feature remembers the South African anti-apartheid activist, Bantu Stephen Biko (Father of Black Consciousness), on the 40th anniversary of his death, while our ROCK features includes an exclusive interview with King Yellowman (Jamaica) at Reggae on the Mountain 2017 courtesy of Stephen A. Cooper. For our REWIND feature, we give you a sneak peek of Boomtown Fair’s Chapter 9: Behind the Mask festival that we attended in Winchester, England.